Some subscriptions limit the number of devices you can log in with at one time. 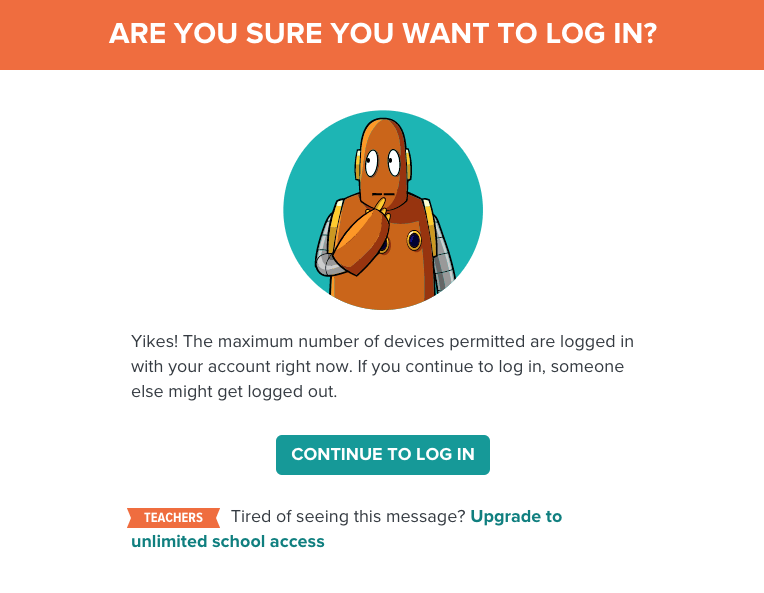 Family subscriptions, My BrainPOP educator accounts, and My BrainPOP student accounts allow one device at a time. Classroom and Homeschool subscriptions allow three devices at a time. Someone using your account didn’t log out before closing the browser window on a device. If this is the case, you can ignore the error message and click Continue to Log In despite the warning. The best way to prevent this from happening is to remember to log out when you are finished with your BrainPOP session. More users are trying to log in simultaneously than is permitted with your subscription type.